The Family Table started as a root beer stand at least 65 years ago. No one knows for sure when it was opened. Many people say," It's just always been there." It was just a small building with picnic tables until 1972. And some say, a hundred years ago a family raised race horses on the land. In 1972 the existing building was built and it became Decorah's A&W. Years later it went through different owners and during the process the A&W franchise was dropped and it was renamed the Family Table. In November of 1993 Scott and Stacey Gossling purchased the restaurant and are still the current owners. In the fall of 2003, the restaurant was completely remodeled and they put on an addition. Through the years the concept has always been the same at the Family Table, nothing fancy just good food. The owners, Scott and Stacey, have always worked in the food service industry. Scott graduated from Buena Vista University in Storm Lake, Iowa with a Bachelor's degree in History. Stacey graduated from Midland Lutheran College in Fremont, Nebraska with a Bachelor's degree in Human Services. Scott grew up on a farm by Waucoma, Iowa. He is a 1986 graduate from Turkey Valley High School. Stacey's family moved around many times due to her father's job. She lived in Massachusetts, New York and graduated from Klein High School in 1986 in Spring, Texas. After many years of working for big corporations such as Marriot, Little Caesar's, and McDonalds they moved to Decorah in 1993 and purchased the Family Table. 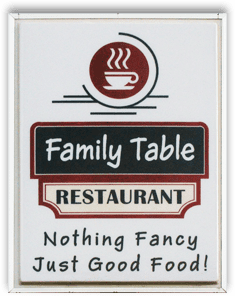 Trendy restaurants come and go but the Family Table has always remained the same - locally owned and operated. It has always been important to Scott and Stacey to be a friendly neighborhood establishment and an attractive, clean and comfortable atmosphere for all ages. Nothing Fancy, Just Good Food! 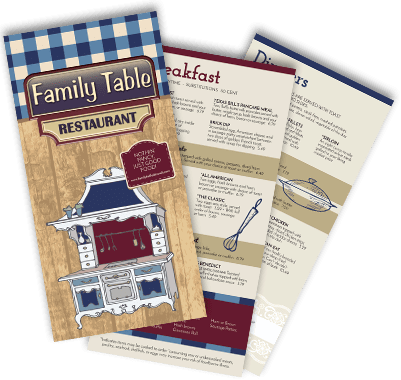 Copyright © 2019 - Family Table Restaurant, Decorah | All Rights Reserved.